BRIER BOUND – Steve Fecteau and Scott Odian sweep a shot from skip Bob Smallwood Sunday at the Whitehorse Curling Club. 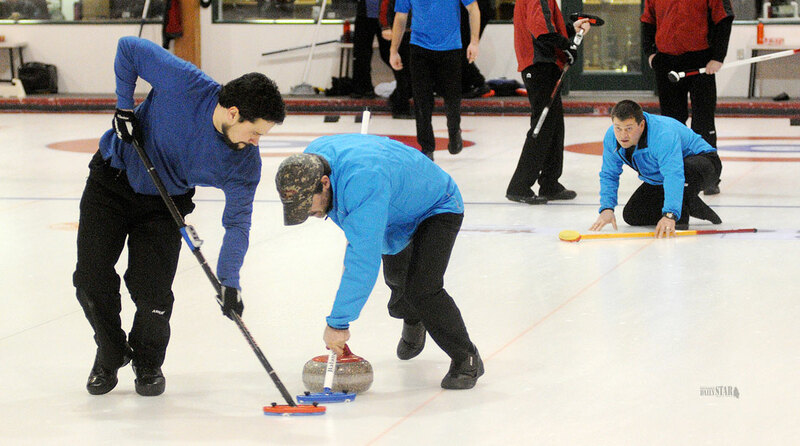 Team Smallwood went 5-0 in the Yukon Men’s Curling Championships to earn a trip to the Brier. 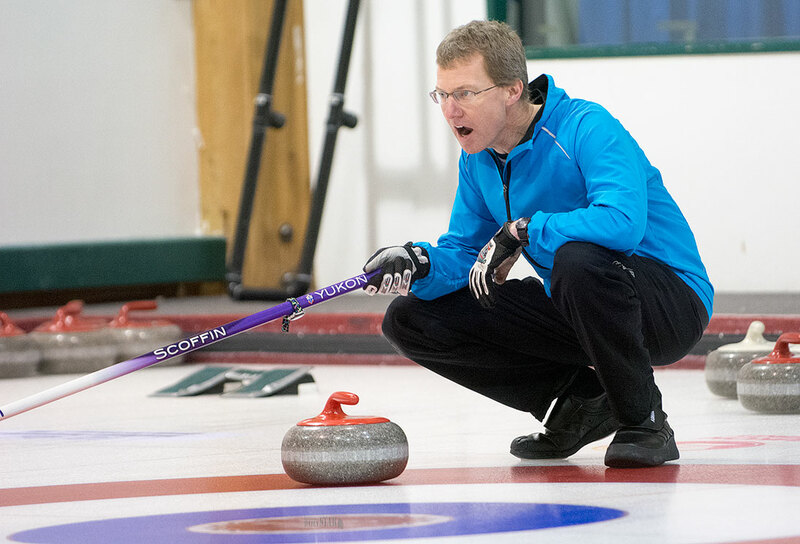 UNDEFEATED – Team Smallwood third Wade Scoffin calls to his sweepers during men’s championship action Friday at the Whitehorse Curling Club. Bob Smallwood is returning to the Tim Hortons Brier this season with a new rink and a new name. The 40-year-old skip guided his team to a 5-0 record at the Yukon Men’s Curling Championships over the weekend, earning his rink a crack at the 2015 Brier in Calgary, Feb. 26 to March 8. The team will need to beat out both Nova Scotia and P.E.I. in a pre-qualification event to land a spot in the main draw, however. Smallwood will be joined by third Wade Scoffin, second Steve Fecteau, lead Clint Ireland and fifth Scott Odian. Smallwood previously curled on the junior circuit as Robert Andrews, before representing the Atlin Curling Club at the Brier in 1994 and 1995. In 1999, he changed his last name to Smallwood to honour his grandmother, Ellen Smallwood, whom he regarded as his No. 1 fan. The young skip turned heads in his first Brier appearances, finishing with 2-9 records at both events – even handing legendary Alberta skip Kevin Martin a rare loss in ’95. The pre-qualification event, beginning Feb. 26, is a new implementation by the Canadian Curling Association this season. Previously, the Yukon and Northwest Territories held an annual playdown with the winner representing the North at the national championships. Yellowknife skip Jamie Koe had won eight of the last nine playdowns, with the exception being 2008 when Whitehorse skip Chad Cowan took the honours. Smallwood’s rink bested all comers at the Whitehorse Curling Club on the weekend, beating Walter Wallingham 9-4, Pat Paslawski 7-2, Ray Mikkelsen 9-4, Tyler Williams 10-8 and George Hilderman 7-6. Paslawski, last year’s Yukon champion, finished second with a 4-1 record. Calls this morning to Smallwood and Scoffin were not returned in time for publication. Meanwhile, on the Alberta junior circuit, 20-year-old Thomas Scoffin failed in his quest to make an eighth appearance at junior nationals. The University of Alberta skip lost 8-7 in an extra end of his semifinal tilt versus Jeremy Harty at the Alberta provincial playdowns in Grande Prairie over the weekend. Harty would go on to drop the final to Edmonton skip Karsten Sturmay by a score of 7-4. Thomas Scoffin, the son of Wade Scoffin, was in his last season of junior eligibility. The Canadian Junior Curling Championships, will take place in Corner Brook, Nfld., Jan. 24 to Feb. 1. Rick Folk of the Kelowna Curling Club represented BC at the '94, and '95 Briers.